I have always been facinated with the idea of free falling, and when I heard from a friend that he was going to take the plunge I immediately wanted to join in the fun. The three of us booked a jump within a few days at Picton and I was so nervous/excited that I couldn't sleep. But when it rained and we realised that our jump would have to be postponed, I started to feel even more eager to just do it. Also I think the few extra days of waiting and thinking about it helped me relax, and when the fated day arrived I was so ready to jump. 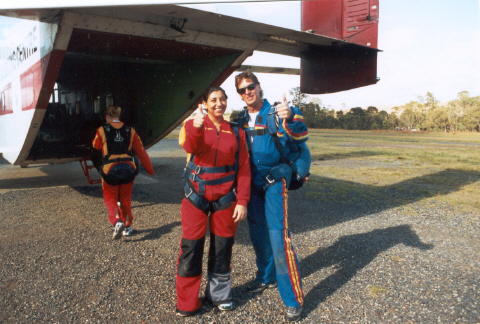 My first tandem skydive happened on Friday 18, January 2002. We were a group of 19 people cramped in a small airplane and the weather was glorious. My tandem instructor was such a great guy and made me feel at ease. I was surprisingly calm as the plane made its ascent to about 14000 feet. My instructor talked me through the positions once more and we jumped. No words can describe the amazing feeling you get as you are free falling. There's no time to feel fear. It's just such an incredible rush! !